Panama Rocks is reputed to be the most extensive formations of glacier-cut, ocean-quartz conglomerate in the world, forming a ridge half a mile long. The history of the rock formations date back about 400 to 350 million years ago (Ma), during the Devonian period. To provide perspective on the age of these formations, it is believed that the first animals classified in the genus Homo appeared only 2Ma. Modern humans (Homo sapiens) are believed to have originated about 200,000 years ago. During the Devonian, the landmass that makes up the core of the North American continent was rotated 90 degrees (what now faces east then faced south) and straddled the Equator. In the middle Devonian (385Ma) most of the area that forms modern day upstate New York, western Pennsylvania, eastern Ohio, and Lake Erie was a shallow inland sea known as the Appalachian Basin, between the upraised Cincinnati Arch on one side (in modern day Ohio) and the now-vanished Acadian Mountains on the other. 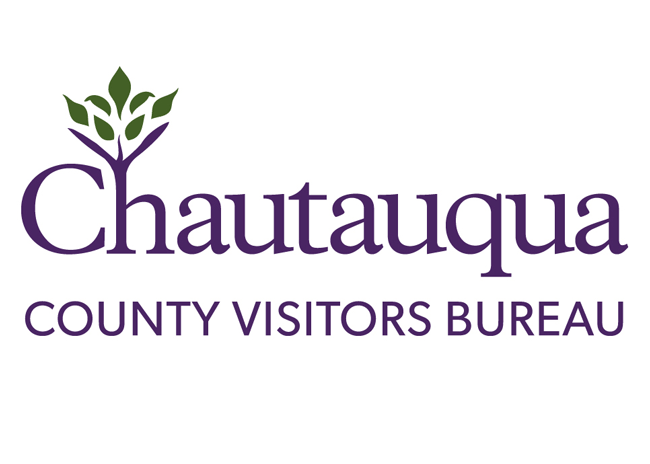 In what is now Chautauqua County, vast expanses of shallow, muddy water spread over sand flats and salt meadows, shaped by ages of wind, waves, and currents. 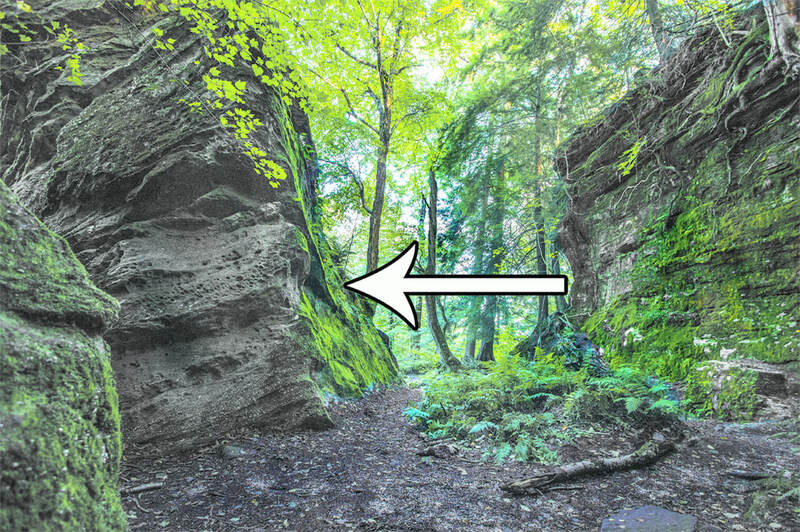 Time and pressure worked for ages (in the late Chemung period of the Devonian or the in the early Catskill period - about 350Ma) as sediment built up and slowly compacted, pushing out water and creating the natural cement that formed the sedimentary rock visitors at Panama Rocks see today. This type of rock is known as "quartz-conglomerate", and it is sometimes referred to as "pudding stone” or "Panama Conglomerate." Stones embedded in this rock are oval and rather flat, due to the water action (wave action) they experienced when they were on those ancient beaches. The embedded stones are quartz (white), spar (pinkish amber) and flint (tan). During the Devonian, animal life was just emerging from the seas and the first forests were beginning to spread over the Earth. Primary life forms were corals and marine mollusks. Radiolarian, crinoid, and syringopora are some of the fossils that were found in Panama Rocks in the 1800's. About 347MA the late Devonian extinction occurred and about 50% of all genera went extinct (late Devonian extinction). The formations at Panama Rocks were in a geologically stable area far enough inland to be protected from the Acadian and Appalachian orogenies (the process of mountain formation, especially by a folding and faulting of the earth's crust) that impacted North America’s eastern seaboard. During the Pennsylvanian period, about 300Ma, upstate New York and western Pennsylvania was a lowland swamp. About 250Ma, with the formation of Pangaea, eastern New York State was located inland, in the tropics, and was part of the Central Pangaean Mountains, whose remnants include the Appalachian Mountains. Around the same time the Earth's most severe extinction event occurred, with up to 96% of all marine species and 70% of terrestrial vertebrate species becoming extinct (Permian–Triassic extinction event). Approximately 165Ma, there was major geological activity on what are now the East and West coasts of North America. It is believed that the formations which became Panama Rocks were slowly raised to their present altitude (1650 feet above sea level) at this time. After the rock layer had been fractured, the seepage of water through overlaying sediments carried minerals (iron, lead, etc.) in solution, and it deposited them in the fractures in the rock below. Native Americans obtained lead from a site in the rock formation and sold it to settlers. In 1985, pieces of naturally formed lead were found in the park. The continents began to move into their current positions about 65 million years ago. Around this time there was a massive extinction of most plant and animal life, likely from one or more catastrophic events, wiping out dinosaur life (Cretaceous-Tertiary extinction event). Western New York was near the lower end of an alluvial lowland plain and most of the mid-West United States (from Texas to Montana) was part of the Western Interior Seaway. About 80,000 years ago North American began to be covered by massive glaciers. By 18,000 years ago the glaciers had pushed into the area just north of Panama Rocks. As the glaciers did not withdrew only after long periods of alternating advances and retreats, moraines – ridges marking the edge of the glaciers - were formed in many places. One such moraine extends from eastern Chautauqua County at the northeast of Villanova, NY, extending west to Arkwright, southwest to the upper Cassadaga Lake in Pomfret, crosses Westfield in an east-west direction, and enters Ripley before crossing into Pennsylvania. The moraines that fringed the border of the great glacier dammed the waters that had been turned southward, causing an extensive and irregular lake to extend like the fingers of a hand up the valleys in Connewango, Bear Creek, Cassadaga, and other areas in northern Chautauqua County. Most of the glacier was stopped just north of Panama Rocks saved our rock formations from being ground apart, uplifted and spread further south as gravel. Indeed, expanses of Panama Conglomorate that once rested in northern Chautauqua County are believed to have been destroyed by the great glacier of the last Ice Age. However, there is evidence that the glacier did not advance in a straight line, but rather in the fashion of a tongue or lobe of ice. In Chautauqua County, these “tongues of ice” formed fields of drumlins - asymmetric shaped elongated hills in the shape of an inverted spoon or half-buried egg. It is believed that these smaller ice flows helped carve out the North-South ridge in Panama, which exposed the layer of rock that is now Panama Rocks. After the Ice Age a forest grew over the site, but one that would look unfamiliar today. During this age, known as the Champlain Period, the local climate was warmer than it is now. Mastodons inhabited the area (portions of a mastodon were found just north of Jamestown in 1871), and the climate was suitable for cypress and semi-tropical vegetation. After the end of Champlain period a dense pine forest grew up in the area, which eventually gave way to the maple, beech, black ash and hemlock we see today. Blocks of Rock Move Downhill in a Process Known as "Creep"